A few months ago I bought a bunch of inflatable balls for my son's 2nd birthday party. Since then we have found tons of fun ways to use them for games and learning activities. Our favorite thing to do with our new inflatable balls is play name basketball! Write a letter on each ball (I wrote the letter 4-5 times around the ball). I started by writing the letters of my little guy's name on the balls. Next I wrote his entire name on one of the balls. If your child is older, you could just write simple high frequency sight words, names, or other favorite words that your child likes (ball, cat, dog, bug, etc.). Line up all the balls and tell your child which ball to shoot. I started by saying, "find the ball with the A." Over time I tried to make it a little harder by saying things like, "find the letter that makes the /n/ sound." You could also say, "find the letter that is at the beginning of... elephant (e)" if your child is older of knows their letters well. With older kids you could also have them spell their name by shooting the balls in order into the bucket. We also played this game by shooting the balls into the basketball hoop AND kicking the balls into our soccer net. Each time we shot or kicked the ball into the hoop/net we'd say the letter name on the ball, say the letter sound, and we'd try and brainstorm other words that started with the letter. Mostly I brainstormed... and my little guy would say "yes" if I came up with a good word. I mostly just stuck to the pictures that we see often in our ABC books. When we were done, we sang our favorite name songs (I love singing "BINGO" and just changing the letters to my son's name) and the ABC song so we could practice our letters a bit more. This can be an indoor or outdoor activity! Do you have any other favorite name activities you like to do with your kids? I love this activity. 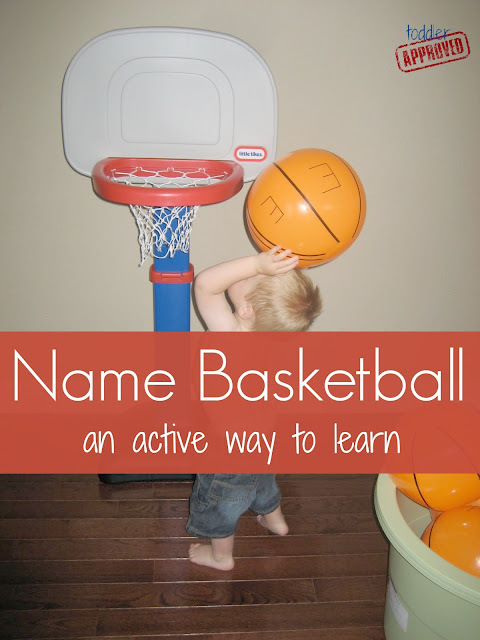 What a fun way to learn the letters of your name for those active learners. I have two little boys who would LOVE this!